The Victorian Condos are located right on the Galveston Seawall near 63rd St. The Victorian offers ocean front patio views and amenities galore for your island vacation. Starting with a 24 hour front desk, gym, swimming pools, tennis court and picnic areas. The pool is heated year round, complete with waterfall lagoon and The Victorian also offers a separate play area for kids called Paradise Cove. 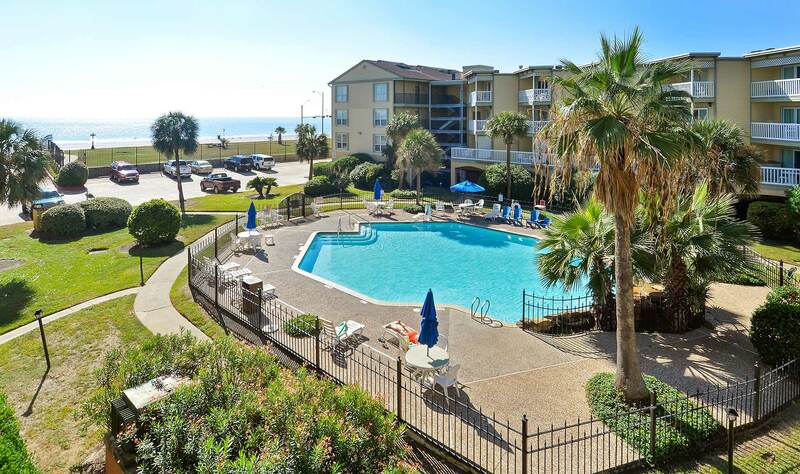 The condos for rent in Galveston are fully furnished and have mini kitchens, perfect because The Victorian is located right next to Kroger’s, the biggest grocery store on the island. You can pop over for snacks and save money by cooking a few meals, leaving more in the budget for activities. Another perk is you’re right next door to Rita’s Italian Ice where you can pick up something cool and refreshing on one of the infamous hot Texas days. Don’t forget you can also rent a bicycle from Gulf Coast Concierge. So after you enjoy your Italian ice, you can cruise up and down the Seawall and take in all the stunning views of the Gulf of Mexico. After a day lounging poolside or beachside at our condos for rent in Galveston you’ll be ready to soak up some of the island’s history. Start with Pier 21 and watch The Great Storm or one of the other informative short films about Galveston Island. While you’re there explore the Elissa, a sailing ship from 1877 and go sightseeing on Baywatch Dolphin Tours. Don’t forget to grab lunch at Fisherman’s Warf or one of the many restaurants you can find strolling through downtown. After a long day touring the island head back to The Victorian Condos and unwind soaking in their outdoor hot tub area. Located near popular 61st, The Victorian offers a great location and loaded amenities perfect for a couples or family vacation.